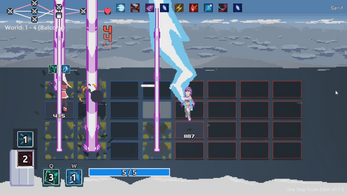 One Step From Eden is a deckbuilding roguelike with relentless real-time Battle Network combat. Cast powerful spells on the fly, battle evolving enemies, find game-changing artifacts, make friends or make enemies, just make it to Eden. Demo Patch - v160 +30,000 downloads! New Character - Reva v150! New design and animations for Selicy! Hey I am having problem getting the Linux version of Eden to work with steam as a non steam game at the moment I am using my steam controller on desktop mode. Outside of that this game is awesome and I am sure this game will be the death of me both financially and physically. Also if somehow you get EGS to notice you please don't put it there I would appreciate that. Posting my review in the comments aswell, if that's okay ! After playing this demo for almost an hour, I can safely say that it's a great foundation for a potentially awesome game. The core gameplay has everything you could ask for and it's easy to get lost in the possibilities that it could offer. The fullscreen mode is a little blurry but I guess it's not final. The UI is a bit confusing and cluttered but still works fine, I can imagine the challenge when designing such a system. The controls feel super good most of time except when you have to move fast around the tiles, but maybe that's intended. Ennemies are fair and diverse enough (for a demo), but their movement is hard to predict so certain spells are less likely to hit, but this part can probably be solved by getting better at the game. However, attacks that destroy tiles often feel bad for the player because not only it forces them to dodge incoming attacks in a particular way (that's good btw) but also often prevents the player from attacking while dodging, this is clearly the case against the first boss. Destroyed tiles can also trap the player in a 2-tile area with a bouncing attack alternate between them, so it's impossible to dodge. That's unfortunate. The tile system could also be improved by adding different configurations of tiles in certain battles, but that could actually be hard to integrate without altering the flow of combat. At the moment, choosing a path over another feels pointless because they're not randomized between each run, and they're not varied enough, but that'll probably change. It's also hard to read where you can and cannot go, there probably needs to be intersections battles/events like in Slay The Spire. I bring up Slay The Spire because this is the first thing that came to my mind when playing One Step From Eden, the two games are really similar in many instances, mostly the map and the ever-returning deck of cards/spells. Beyond that, let me say once again that the game has a really strong foundation. It just needs polishing. Whether it be a more unique art direction (which is kinda good already, just a bit generic), better UI, refreshing gameplay loop, clearer text, controller support. It also needs content, obviously : More cards, ennemies, bosses, characters, upgrades, decors, events... I have so many ideas ! That's how great the demo is. So yeah, all in all One Step From Eden is really promising, I hope it goes beyond my expectations, will of course be watching its development from afar, and try it out every time a new demo is playable. PS : I haven't really paid attention to the music so far, so I don't know what could be improved about it. Oh you're right, I didn't catch that, I don't think the game properly shows you that option. That's very good, thanks, I edited my comment. Hey Malefic, thank you so much for that fantastic review! Stuff like this is super helpful, and I'm happy to say that a lot of your concerns are already on my radar! You can try increasing the screen scale to make it less blurry. I will be working on everything you mentioned, including lots of polish and a ton more content! I don't think the posts here get too much visibility so I've been neglecting it a bit! I'll try to post here a bit more though :) I think it's mostly bug fixes with a couple new spells thrown in cause I like you guys. could you add the ability to re-size the screen? the fact that just a bit of the bottom gets cut off really bugs me, that or a fullscreen would be really nice. keep up the good work! thanks! not sure how i missed it, i tend to be unable to use my brain on occasion. Good job with the game so far i'm looking forward to the full release! *checks itch.io 3 weeks or so later, sees that OSFE no longer has demo in the title* WHAT!? RELEASE ALREADY?! but why does it feel so much harder? everything suddenly seems so much faster, is this because you sped it up? or is it just because i haven't played in a week... or 3. Thanks manky I'll take a look at that bug! I don't think I made the game much harder, but there were definitely some tweaks! Hahaha, I keep having to build demos for showcases and booths (currently GDC and PAX East). So I end up updating the downloadable build too! That reference to FFR made me laugh for ten minutes straight, keep up the amazing references and game development! Also, good lord, maybe i'm just not good, but i beat Reva in my first try, but beating HER is so difficult! i spent 7 hours trying to beat HER, and then I finally did. it wasn't worth it. How to survive from the hero's magic arrows when I AM Reva?? Reflect is Reva's "weapon" you can press E on the keyboard to reflect any attack for a short duration (it costs 1 mana). what is the story here? The story is still a wip, but it's about all the characters making their way to Eden! There will be one more update for the demo soon-ish! I only played for like 30 minutes and this game is utter gold. It is simple enough to start but has enough complexity to make this a very competitive game if the game had online game-play in the future. Hopefully in the distant future it would definitely expand the life of the game and I cannot wait for the finished project. This game is pretty awesome to play. The controls are a little fiddly and takes time to get used to but this game had potential. I created a video on it and go into more detail on what I like and don't like about this game. I BEATEN HELL MODE !!!! I don't think I uploaded anything to AGDQ threads, do you mind linking me to that? I'm glad you like it so far though, thanks! I have been busy with college stuff and haven't been able to try the new versions, but here's that time I manege to unlock the Vera hidden route. I've been musing for the past 2 years where are the BN inspired games, since we didn't see a lot of it. I'm super happy I found this. Great job. cant wait to play the full game! Is this the Next popular game? lets gets this one the top rated Game!!!!! The art for this game is so good! I was immediately drawn to it just on the art alone. After listening to the music form the trailer and playing the demo, I decided that buying the $50 tier was more than worth it. Did Saffron take inspiration from Curly from Cave Story? OK for the love of god, PLEASE allow us to either drop artifacts or refuse to pick them up. I keep getting the Spazdrone and it's almost always more detrimental to me than it is beneficial and I hate it. I actually have all the "detrimental" artifacts tagged so they don't show up randomly in the boxes. What is detrimental about the Spazdrone for you? I have gotten a couple complaints about it in the past, and may add it to the list then! While I'm complaining, also not a fan of losing nurses to automatic enemy explosions, but I guess that can be planned around, unlike the drone which never stops shooting when you dodge. Don't worry I made it not trigger Glassify charges on purpose! However, your buster weapon attack will trigger them. Also the counterattacks from the secret boss only do as much damage as they get hit by, so a strategy is to use up all of her counterattacks with low damage hits. Hey lel yeah it is a bit harder on the dpad. I would recommend playing on keyboard if that's more comfortable! thanks for the reply and the advice! Oops forgot to post here when I posted my video, but I had a lot of fun with this game! It's pretty fast paced and I wasn't able to beat the boss cause hoo boy is she fast! Still pretty fun though. Hope you enjoy the video! Love it, hope it's still backable by the time I get paid. PLEASE put it on the Switch. There were a couple rounds that I didn't get hit and it felt amazing, so excellent work on everything gameplay-wise. I hope that the full version has its own "battle won" jingle, and tones down the memey stuff. It's just not my taste. Thanks for the reply! Can't wait to get my plushie. That last boss is super fast! If you treat it like a puzzle game though there are some patterns that you can follow. For example, she goes back to the same highlighted tile after all her attacks. And when she sends 4 swords to your side of the field, they activate in the order she sends them over :) Thank you don Jay! Made it to the last boss, I'll have a friend to test it the game and see if he can beat Selicy, I'll get good in this game some day. Haha good job Riley and thank you! I hope he can beat HER!